“I welcome this recommendation. I agree that we need to do more. I believe that the steps we are taking to introduce more affordable childcare this September will have a significant impact on helping parents to take up jobs or go back to training and education. For four years, we have received a recommendation in relation to childcare. This year it is being recommended that we enhance social infrastructure including quality childcare. We are also being asked to deliver an integrated package of activation policies to increase employment prospects of low-skilled people and to address low work intensity of households”. The Government has invested an additional €19m in childcare for 2017. As a result tens of thousands of children and their families will benefit from childcare subsidies. From September, existing targeted childcare supports provided under the Community Childcare Subvention Scheme (CCS)will be enhanced significantly, some by up to 50%. In the case of the top rate of CCS, the subsidy will rise from €95 per week to €145 per week. This is a meaningful increase. It will greatly help many families to return to education and employment. In addition, all children from 6 months to 36 months in Tusla-registered childcare services will be eligible for some level of childcare support. Those in full time care will receive €80 per month towards the cost of their childcare. The financial supports will be provided directly to Tusla registered childcare providers. 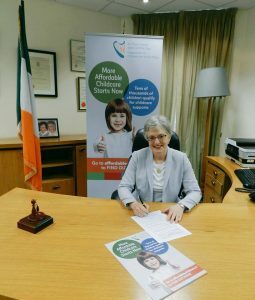 All Tusla-registered childcare providers, community and private, can sign up to provide these Schemes, ensuring accessibility throughout the country in a range of services to suit the needs of parents.